Your NEW car becomes a USED car as soon as you drive it off the lot. 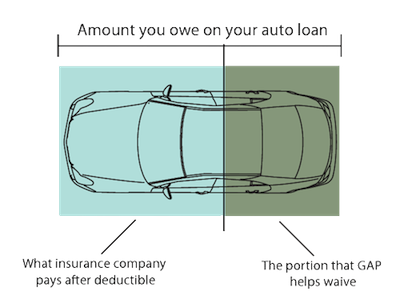 If the value of your car is less than the balance of your auto loan, you're "upside down," and there is a gap that isn't covered by standard auto insurance. This difference requires a special type of protection called GAP coverage. A car starts depreciating as soon as you buy it, but never more than when you drive it off the lot — turning it from a "new" car to a "used" car. To estimate the anticipated depreciation and potential GAP risk, please contact your credit union representative and ask to receive a GAP Risk Illustration through the VisualGAP system. What is GAP? Peace of Mind! If your vehicle is ever totaled or stolen, your primary insurance will usually pay only the current market value of your vehicle, less your deductible. If the actual cash value is less than your current loan amount, the result could be a financial gap where you must pay the difference between your loan balance and your insurance settlement. This could mean thousands of dollars out of your pocket. Help eliminate this possible out-of-pocket burden with GAP. Help ensure peace of mind that you will not continue to owe for a vehicle you can't drive. Help protect your credit rating.